The first photo of the Earth from the Moon has been historical and a printed poster of the image were presented as souvenirs to visiting dignitaries to the USA. It’s often said, photographs are frozen memories, and rightly so in many aspects as they capture a moment, thereby, making it memorable and sometimes, it could just go on to become historic. Just like on August 23, 1966 – when the first photo of Earth was captured from its satellite Moon. It’s been 50 years since this first photo was captured and produced by NASA’s Lunar Orbiter 1. The photo was transmitted to Earth by the unmanned robotic spacecraft and received at the tracking station at Robledo De Chavela near Madrid, Spain. The image was taken during the spacecraft’s 16th orbit. August 10 was the 50th anniversary of the launch of the first of five lunar orbiters that returned images of “99 per cent of both the near- and far-side surfaces of the moon”. According to a report, the lunar orbiters had sent back a total of 3,062 photos. The first spacecraft, Lunar Orbiter 1, left Earth on August 10, 1966, and after 92 hours, it was finally orbiting the moon. According to NASA, the Lunar Orbiter 1 – built by The Boeing Co. – was launched on an Atlas SLV-3 Agena-D rocket from Cape Canaveral in Florida. It was mainly designed to take photographs of smooth areas of the Moon’s surface, which would help to select landing sites for the Surveyor and Apollo missions, later launched by NASA. Though, initially, there were debates, as changing the satellite position would endanger the orbiter’s main objective, NASA finally decided to take picture of our planet. 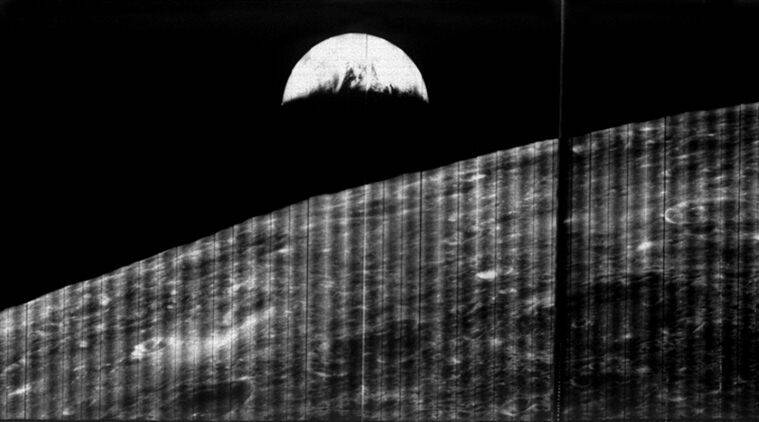 Thereby after lot of considerations, on August 23, 1966, “the spacecraft successfully took a photo of an earthrise, the blue planet rising above the moon’s horizon,” reports Space.com. Since then, this first photo of the Earth from the Moon has been historical and a printed poster of the image were presented as souvenirs to visiting dignitaries.